Erowid DMT Vaults : Got Changa? Citation: Hanna J. "Got Changa?" Erowid Extracts. Nov 2008;15:18-19. One of the more interesting topics that came up at the 2008 Boom Festival was a "new substance" called changa (or xanga), which I had not heard of before. 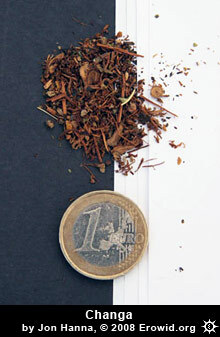 One British visitor described changa as a chunky brown plant-based smoking blend. He was unsure about its legality, but said it was sold "under the counter" for £20-30 ($27-40 USD) per gram in Camden headshops. He characterized it as being "opiate-like, with the teeniest creep of DMT-like effects", and said he had heard of people mixing DMT into it. He mentioned a particular quality of electricity that occurred in one's hands after smoking it, which he called "changa fingers". Later, in response to us scrawling "Got Changa?" on our booth's whiteboard, a fellow from Brighton showed us some. He said it combined DMT with a MAOI plant, which extended the DMT effect from 3-5 minutes to about 20 minutes. On viewing the changa, I noticed that it looked similar to a Banisteriopsis caapi-plus-DMT smoking blend I'd seen earlier this year in Basel. Energy Control ran TLC on a small sample, and it spotted positive for DMT. There were three other unidentified spots, one of which the EC worker speculated might be a harmala alkaloid due to its fluorescence (although without having reference standards on hand, he could not say for sure). An Erowid contributor from Australia provided the following data: changa is largely produced in Australia, and blends vary in composition-they may contain several herbs at different concentrations, but most incorporate Banisteriopsis caapi (either leaves, or shredded stem-bark, or both) and DMT, which is usually extracted from Acacia obtusifolia. A couple of festival-goers brought out two different blends of changa for us to photograph. Another Australian visiting the Erowid booth claimed to be the person who invented changa. He said it is generally 20% DMT by weight, sourced from Acacia obtusifolia or A. acuminata. This extract is deposited onto a smoking blend that usually contains 60% B. caapi, passion flower, mullein, and peppermint. The remaining 40% typically contains Calendula officinalis, Justicia pectoralis, Nymphaea nouchali var. caerulea (or another lily), and Turnera diffusa. He expressed that changa is best smoked from a bong, but that people commonly take 2-3 puffs from a medium-sized joint. While these Australians were very knowledgeable, some changa dealers may not know what they are selling. For example, one buyer at Boom was told that changa is a legal blend of four herbs said to be in the "family of DMT and Salvia". In most countries, changa can't be considered legal, and none of its ingredients are in the Salvia family. The composition of changa blends varies, but most incorporate Banisteriopsis caapi and DMT. Combining harmala alkaloids and tryptamines is nothing novel, with at least hundreds of years of ayahuasca use, and a couple of decades of subcultural experimentation in the United States. In 1985, Gracie and Zarkov described their experiences with smoked extracts of Passiflora incarnata, Peganum harmala, and Banisteriopsis caapi in their paper "Three Beta-Carboline Containing Plants as Potentiators of Synthetic DMT and Other Indole Psychedelics". In his 1993 book True Hallucinations, Terence McKenna related the effects of smoking B. caapi stem-bark while high on psilocybin-containing mushrooms. And in 1994, D. M. Turner wrote about combining an oral MAOI with smoked tryptamines in The Essential Psychedelic Guide. Despite such combinations not being new, the commercial availability of a DMT/MAOI smoking blend is a noteworthy recent occurrence. How much MAOI could be contained in a few puffs of a changa joint? While the leaves of Banisteriopsis caapi generally have a higher concentration of harmala alkaloids than the vine, they nevertheless may only contain 0.28-0.7%, or about 3 to 7 mg of MAOI alkaloids per gram of dried leaf.4 Using one recipe's suggested 50% B. caapi leaves plus 50% DMT (by weight), this adds up to only 1.5 to 3.5 mg of MAOI alkaloids in a one-gram joint-and changa is frequently diluted further with other herbs that don't contain MAOI chemicals. Few people smoke a gram of material alone. If a changa joint is split between three or four people, then each person is getting, at most, one milligram of mixed harmala alkaloids. Justin Case ended his description of this smoking blend with the statement: "The degree to which [Banisteriopsis caapi leaves] can prolong the effects of DMT must be experienced to be believed." Could such a minuscule amount of harmala alkaloids really cause so much potentiation? In his bioassays of snuffed 5-MeO-DMT, Jonathan Ott characterized 10 mg as his "threshold dose" of that tryptamine, and in three experiments he found this to be significantly potentiated when combined with 20, or 10, or 5 mg harmaline hydrochloride, "irrespective of the diminishing dosage of harmaline-that is, even the minimal dose was appreciably as effective as the maximal in this regard. "6 One might wonder if he would have found 2.5 mg an equally effective potentiator? Or half that much again? Drawing conclusions based on different routes of administration (insufflated vs. smoked) can be problematic. Nevertheless, Ott's snuff findings may provide additional support for Dennis McKenna's speculations on changa's method of action. Erowid looks forward to learning more about this intriguing approach to smoking DMT. Reality Pixie. "Uploading the Conciousness Worm". Erowid. Erowid.org/experiences/exp.php?ID=42167. Case J. "Favorite Rolling Mixtures". The Entheogen Review. 2006;15(1):34. Ximot. "Changa (smokeable Ayahuasca)". Bluelight. Accessed Oct 19, 2008 at: Bluelight.ru/vb/archive/index.php/t-322186.html. Trout K. Trout's Notes on "Ayahuasca and Ayahuasca Alkaloids." #A-5 [Version 11-98]. Better Days Publishing. 1998. McKenna D. Personal communication. 2008. Ott J. Shamanic Snuffs or Entheogenic Errhines. Entheobotanica. 2001. 102.